Some people are much more focused on the process and taking the right steps, while others believe the results are most important. 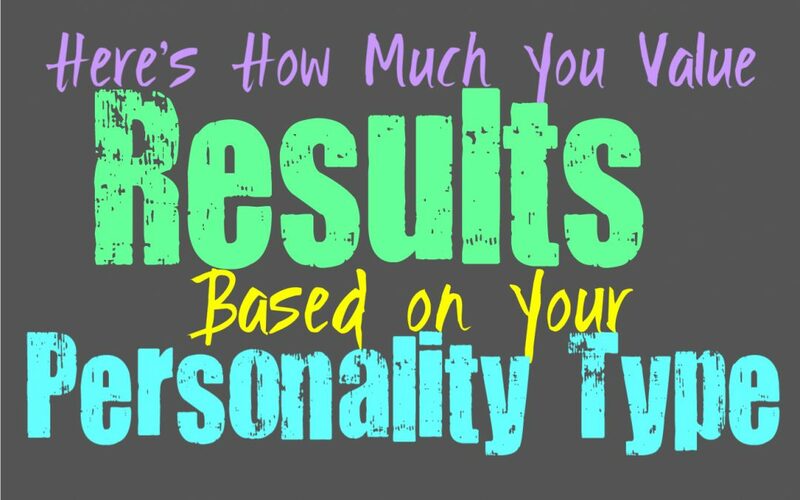 Here’s how much you value results, based on your personality type. INFJs are often more focused on the process and making sure the choices they make are sincere and good. They aren’t the type to focus on a means to an end, and believe that it is important to follow a path that is right. At the same time they do value getting positive results, they simply believe in doing it in a way that is conducive to their own morals. For the INFJ it is about balance, about taking the right steps towards the results they desire. They can certainly be perfectionists though, and want to make sure things end up in the right place. ENFJs do believe that getting the right results are important, but at the same time they believe in making the right choices along the way. They don’t want to do anything that goes against their morals, but they do have a perfectionist mentality. They are often very focused on the future and want to be sure that the results they achieve are the ones they desire. They are driven people who work hard to achieve their goals and do believe in getting the right results as well. INFPs are more focused on the process than the results themselves. INFPs believe in making the right choices along the way, instead of simply making them a means to an end. INFPs don’t believe that it is right to do anything it takes to get the results they want. For the INFP it is more valuable to do the right thing, and make the choices that are sincere and noble. They don’t want to do anything that takes away from that, since they believe in following their strong inner morals. ENFPs believe that results are important, but often believe that the process is much more valuable. They want to focus on the steps before the result, and believe in enjoying the time they have. They don’t like simply focusing on the results, and often feel like this is the wrong way to live their lives. While ENFPs often enjoy getting positive results, they won’t value this more than doing the right thing. Their inner morals often guide the ENFP down the best path for them, even if that means missing the result they desire most. INTJs do believe in results, and are very focused on getting things done the way they desire. INTJs are often perfectionists, who want to achieve their goals and get things done efficiently. This means that they are definitely result driven people, who don’t want to make many mistakes along the way. They strive to get things done the exact way they want, and leave little room for error. While INTJs are result driven people, that doesn’t mean they don’t believe in taking the best steps to get there along the way. ENTJs are extremely result driven people, and are very focused on getting things done efficiently. They are often perfectionists who strive to achieve their goals with a sense of excellence. ENTJs definitely believe in doing whatever it takes to get the results they desire, and won’t allow anything to stand in their way. At the same time they have a strong code of ethics, they simply don’t allow pointless emotions to stand in their way. For the ENTJ results are extremely important, and this is why efficiency is a main focus on theirs. INTPs do believe in getting positive results, but at the same time they believe in the process it takes to get there. They want to experience everything along the way so that they can learn and grow from it. Simply focusing on a means to an end is often not the way the INTP processes things. They want to be able to make the right choices along the way, but also they want to be capable of predicting any changes that might occur before achieving the results they desire. While ENTPs do believe in getting good results, they are more focused on the process it takes to achieve them. They are constantly striving to learn and believe in doing whatever they can to grow their knowledge base. ENTPs want to experience new things in order to truly understand the world around them. If they are solely focused on their results, then they will miss out on the process and actually being able to learn from it. ISTJs are definitely result driven people, who focused more on getting things done. They value efficiency and don’t believe in making excuses. They would much rather focus on getting the job finished, than gripe about the process of getting there. As long as the ISTJ gets the right results they aren’t obsessed with the process of achieving this. They are moral people though, so they do want to make sure the choices they make are sincere. ESTJs are definitely result driven people who believe in focusing on getting things done. Efficiency is very important to ESTJs, and they don’t believe in constantly making excuses. They want things taken care of with a sense of pride and effort, and dislike when people make excuses for their mistakes. ESTJs believe in focusing on the results, and rarely do they care much for the process of getting there. ISFJs definitely are result driven people, and believe in getting things done. They want to make sure their loved ones are happy, and that is definitely their main goal. For the ISFJ the happiness and peace of those around them is the most valuable thing, and often they really only care about achieving this result. As long as they get to this point, the process means less to them than the importance of the result. ESFJs are definitely result driven people, who believe in getting things done. They are mainly focused on making their loved ones happy, and rarely do they care what it takes to get this accomplished. For the ESFJ it is important that they take care of the people they love, and they will often do anything to make sure this happens. This result is what they value most, and to the ESFJ there is nothing that can stand in the way of this. ISTPs are often more interested in the process than the results. They are focused on enjoying the present moment and want to experience the world around them. Instead of becoming obsessed with efficiency and results, the ISTP actually enjoys the process of solving the problem. They want to learn from the present and soak up everything they possibly can. ESTPs are definitely interested in results, but at the same time they are more focused on the present. They strive to get the results they want, but they aren’t all that interested in long-term goals. For the ESTP it is more about getting the quick results, and getting them done the way they want, They are very focused on living in the present and believe in doing things that they enjoy in that moment. ISFPs are not result driven people, and prefer to focus on enjoying the process. They live in the present moment and believe in soaking up their surroundings. For them it is important to follow their hearts and do what feels right to them. Being too focused on results often means missing out on the process, and ISFPs believe in enjoying every step. ESFPs aren’t really result driven people and often believe more in enjoying the steps it takes to get there. They do enjoy having something to look forward to, but at the same time they are more interested in enjoying the present. ESFPs are driven by their surroundings, and want to make each moment count for something. They don’t become obsessed with the results, instead they become focused on enjoying the process.